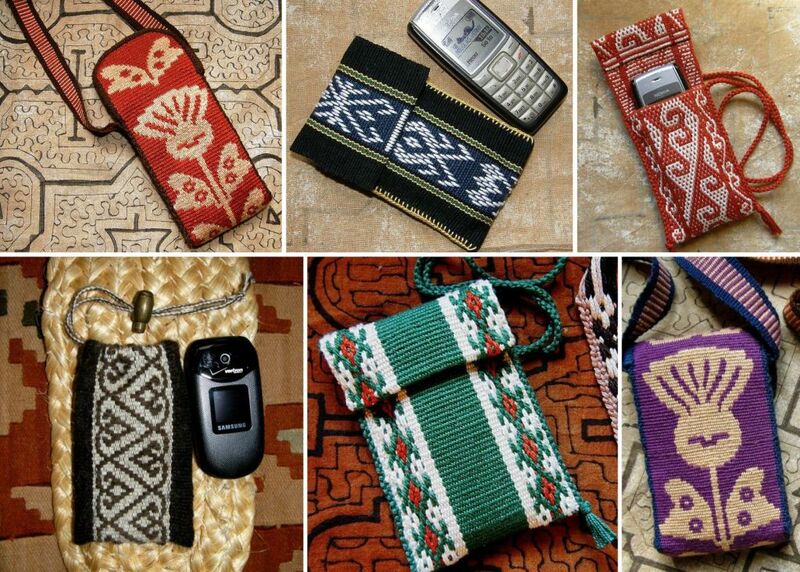 Guarani weaver Angela’s cell phone pouches. Amongst other things, I have decided to do a little tutorial this week on cutting backstrap woven fabric and covering the raw cut edge with a protective band. 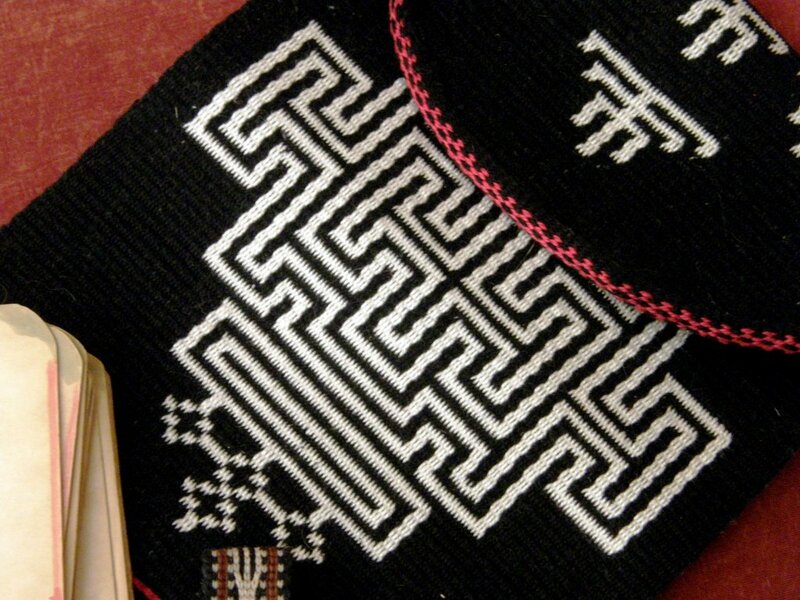 This is my latest favorite way to create the flap on a bag and I was given the courage to try this when I saw some of the work of my GuaranÍ weaving teacher here in Santa Cruz. She makes cell phone pouches with rounded flaps. I don’t know the steps that Angela takes to create these and so, have come up with my own. Possibly I am a bit over-cautious in my ways, but my system works for me and I am pleased with the results. Making cell phone pouches is one of my favorite ways to use a piece on which I have been sampling structures or patterns. You can see the different ways in which I have formed the flaps. This often depends on just how much fabric I have to use. The alpaca sample bottom left, for example, is closed with a drawsting as there was not enough cloth to make a flap. The example at top left has a flap that was cut to shape and then covered with a tubular band. Here are a couple more examples. The flap on the black bag was woven with quite a lightweight fabric compared to that used for the cell phone pouches. The tubular band, therefore was a bit heavy for it and caused the edges of the black flap to curl inward giving a convex shape. As it turned out that actually had its advantages! When the bag is filled with things and takes on a rounded shape, the flap curves nicely around it. I had been calling this latest project “Tales from the Subcontinent” as it comprises designs from Bhutan and Afghanistan. However, now it carries an element which has been influenced by Central Asia. 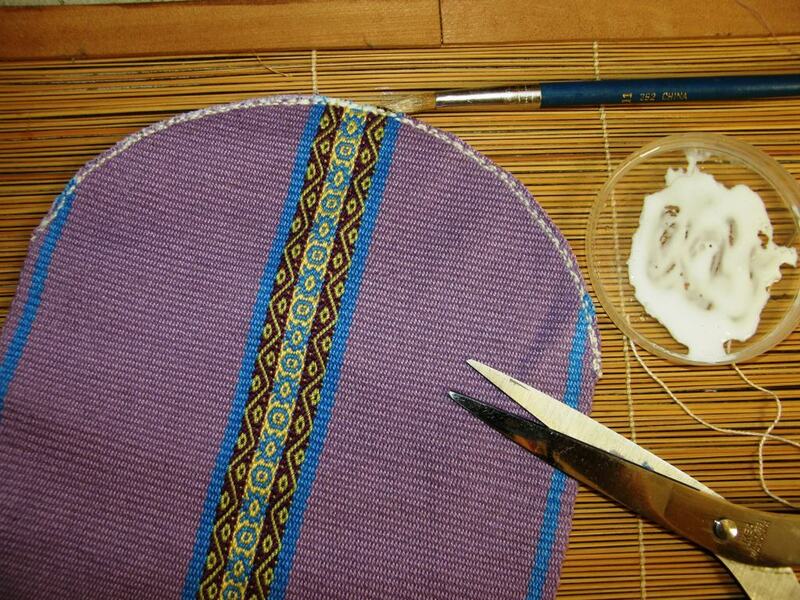 Its closure tab was inspired by tablet- woven trim on Uzbek ikat-patterned robes. 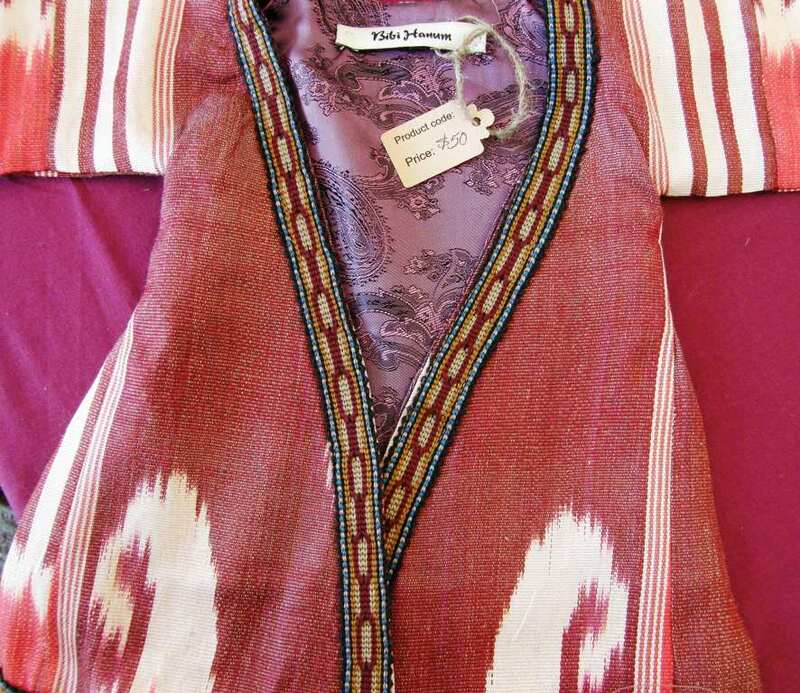 I showed you pictures last week of the Uzbek garments that I saw at the International Folk Art Market in Santa Fe NM with their tablet-woven edging bands. I give many thanks to Ute for writing to me and sharing what she knows about the Uzbek bands as I was about to launch myself onto the wrong path trying to weave one using threads in 4 holes of the tablets. Ute told me that they are created using only two holes. 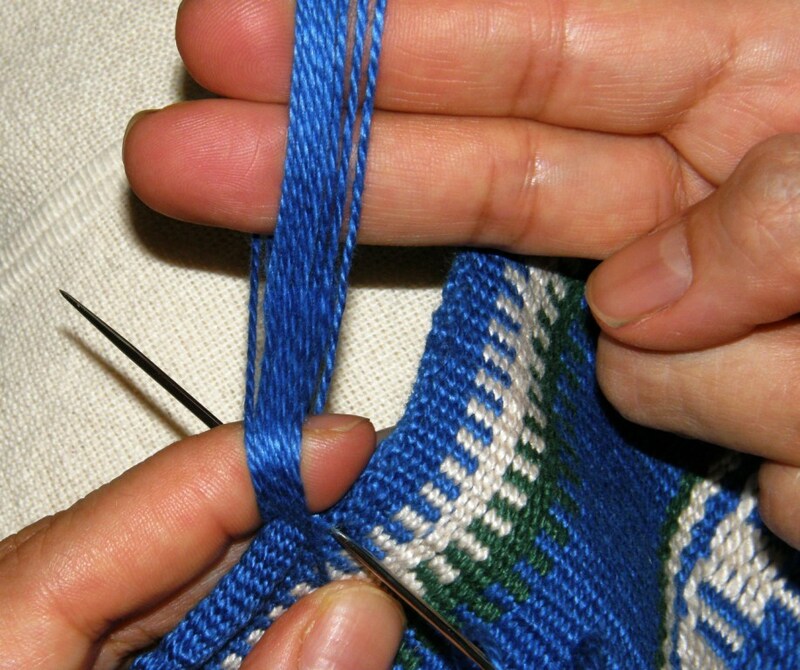 With my limited tablet-weaving experience, I would have been lost without that valuable tip. The little wristband that I bought at the market is in the center. I changed things a little in my experiments eliminating the dark outer color and altering the way the red stripe was set up. I made a sample in a medium weight cotton to start and then made the final piece for the closure tab on the left. Originally I had wanted to make the entire strap for the bag in this technique but decided that it was a bit too “busy” to play such a major role in this piece which was already highly decorated. In this picture I just placed a silver button on the closure tab but I was not all together happy with the way that looked. 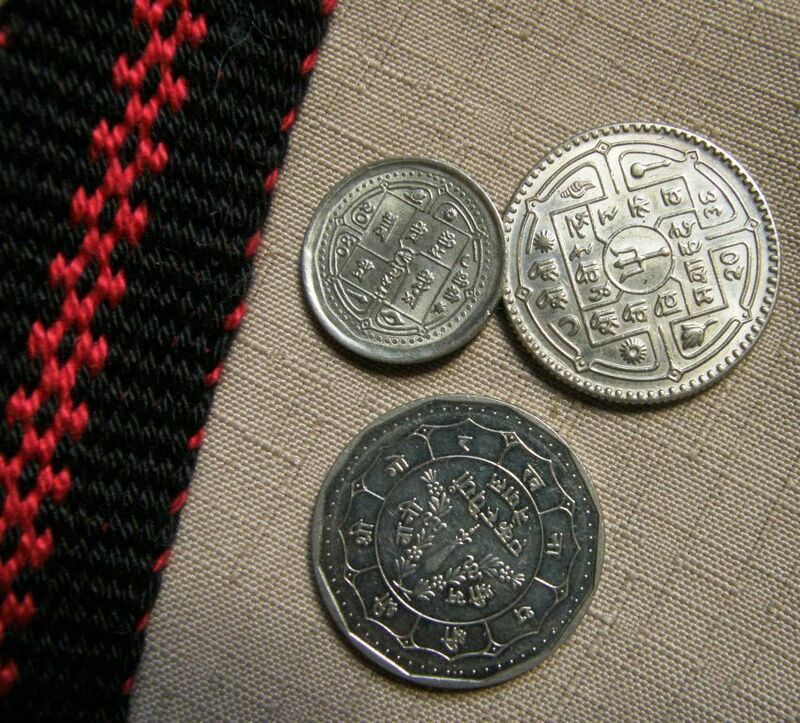 And then I remembered that I had coins from my trips to Nepal back in the 80s and 90s. The smaller one would do perfectly and would be in keeping with the “subcontinent” theme. I just had to polish it up and then get creative in finding a way to attach it. 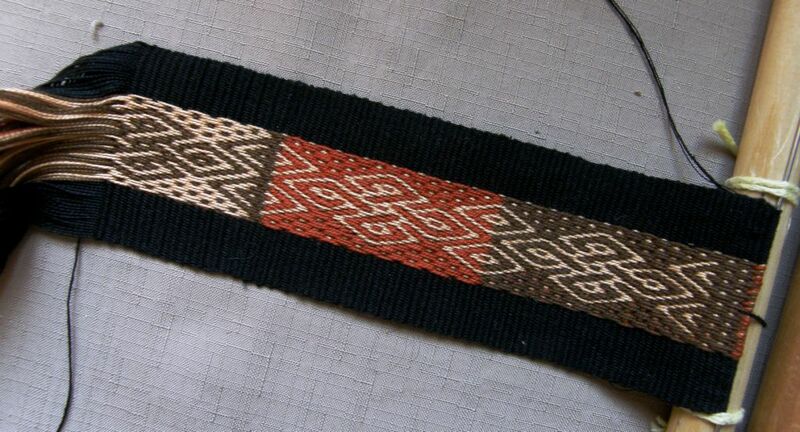 You can see the more subdued strap pattern, above, that I used in the end. I used the same pattern as that on the edging band for the flap. So, with the black bag finished to the point of being able to use it, I am now supposed to be getting on with the next in the wall hanging series. I had gotten as far as winding the yarn off skeins into balls for warping. And then came a distraction. I don’t know what it is about arriving home after a trip. I have this urge to get rid of stuff that goes on for about a week. It’s great! It feels so liberating. So, stuff has been given away and ejected. The above piece was the cover of a photo album that I was given. I removed the album to toss and kept the cloth. It reminded me that it has been a long long time since I last played with three colors in complementary-warp pick-up. I have done three and four-color pieces (see the header of this blog) which are not double faced. Here you can see what I mean by “not double faced”. I made this years ago and decided to hang it unfinished on the wall. It also reminds me that I used to get this beautiful fine wool/alpaca yarn when I lived in Chile. I used some leftovers of that yarn when I first came to Bolivia to weave this. How I wish I could get that yarn again. The piece on the cover of the photo album is double faced. Only two colors show togther on each of the two faces at any one time…color A and B on the upper face and color B and C on the lower one. It is a bright and jolly piece and I love how the weaver flipped colors for just that one small section along the way…you can see how the yellow eyes on the green suddenly change to a red eye in just that one small part. Whether that is the center of the piece, I will never know as it was cut up to make the album cover. So, this is what I am playing with and what kept me up past midnight last night. These are the two faces. I wish I could make a smoother transition from the red background to the beige but this defeated me at 12.30am. I suppose it would be easier if my design weren’t continuous. This is a sampler to get my head back around the technique. Some news… Deb McClintock has started setting up her blog again after losing most of her web page content some years ago in some sort of internet glitch…..heartbreaking. It’s all about simple looms in SE Asia and promises to be wonderful. 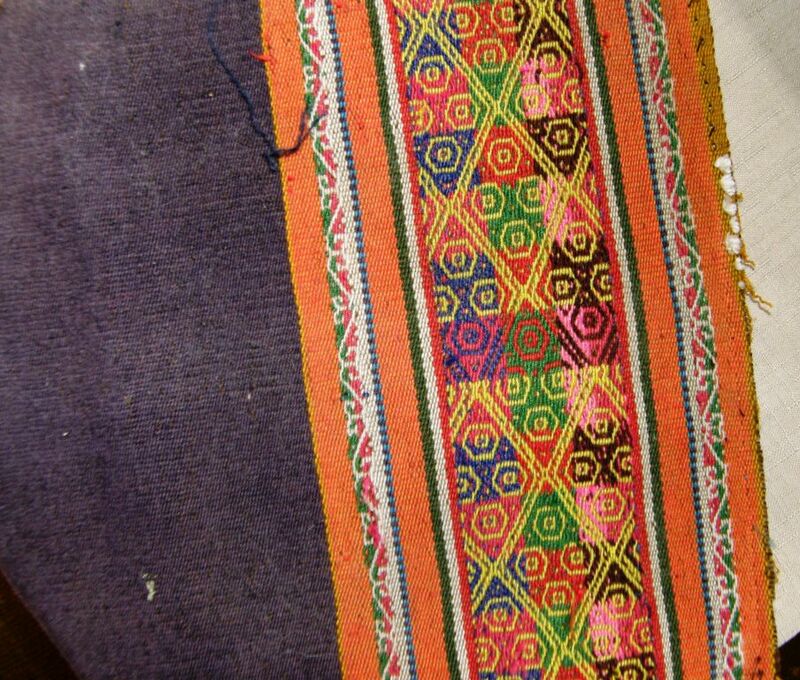 Deb was invited to lecture last month at the Textile Museum in Washington DC about Laos textiles, looms and techniques. Her new blog is entitled Looms of South East Asia. 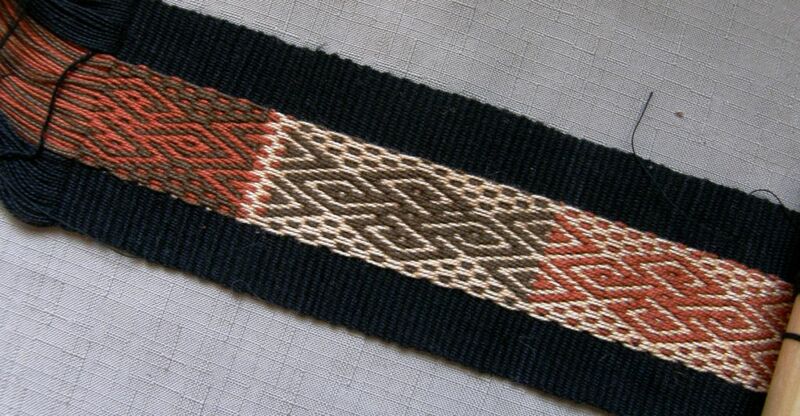 And, of course, don’t forget my Australian mate Wendy Garrity’s blog about Asian textiles and looms…Textile Trails. 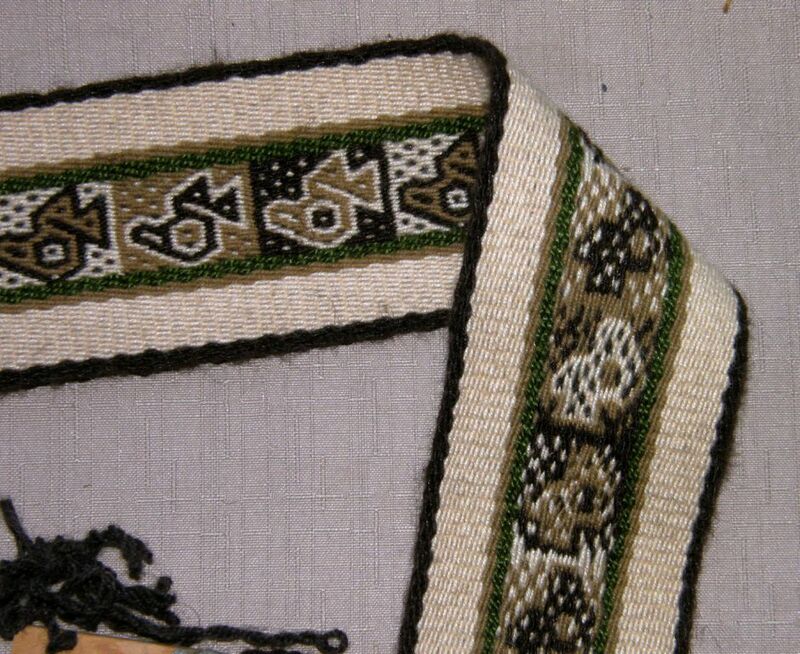 Wendy provided a link in last week’s comments to a picture she took of a notched stick on a loom in Nepal that looks very much like the one I was admiring on the backstrap loom from Myanmar at the Santa Fe Folk Art Market. She was also able to extract more information about the tablet woven bands from the Uzbek representatives at the Folk Art Market than I was! I will most likely be going back to Sydney for a visit in late November and would very much like to meet other weavers! The decision to make this trip has been a very recent one which makes getting people together for this a little difficult as it is so close to Christmas. I haven’t been back in 4 years and am very excited. I’m looking forward to hitching my loom to a eucalyptus tree and weaving while listening to the magpies and kookaburras. 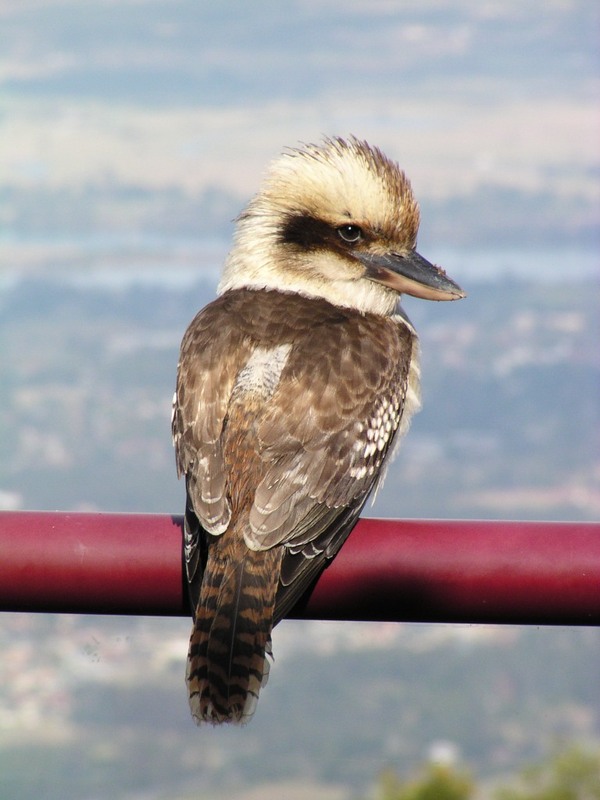 The kookaburra picture at left was taken by my brother. 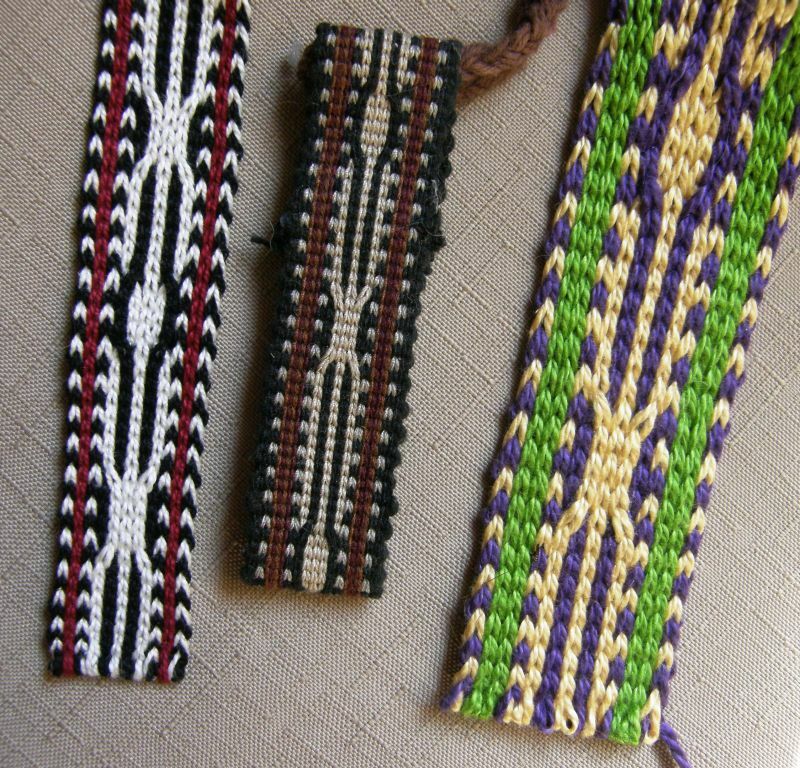 « Backstrap Weaving – Hooray Santa Fe! Laverne! Your new black bag is gorgeous! Just gorgeous! 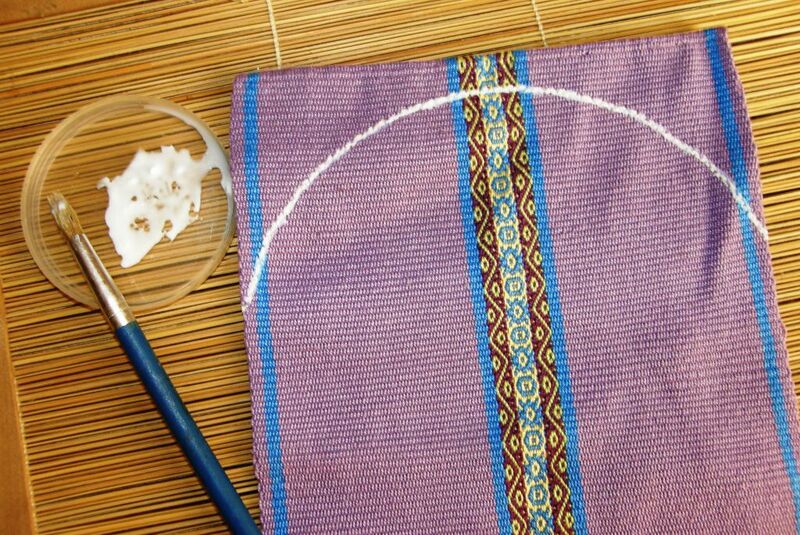 An ikat fabric for a liner would be very beautiful. 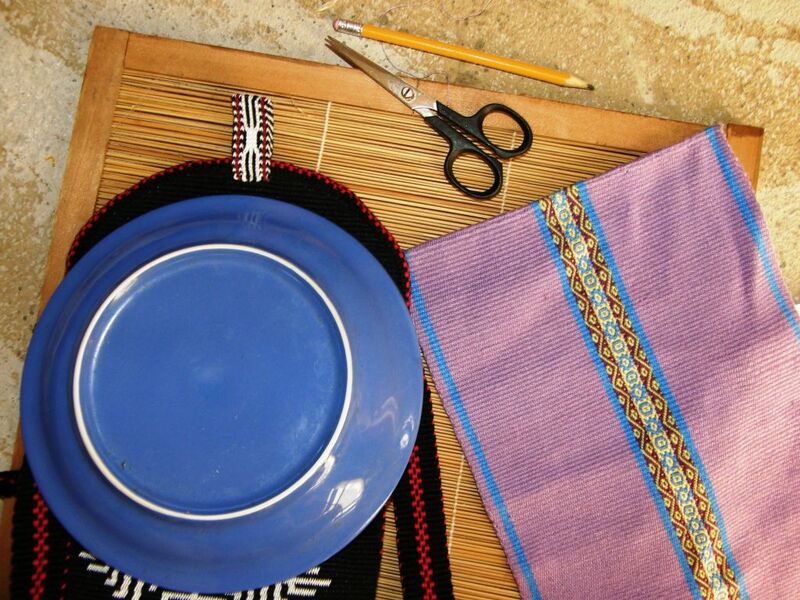 I have it in the back of my mind to try some ikat. I was inspired by the book “Indigo: The Color that Changed the World”. 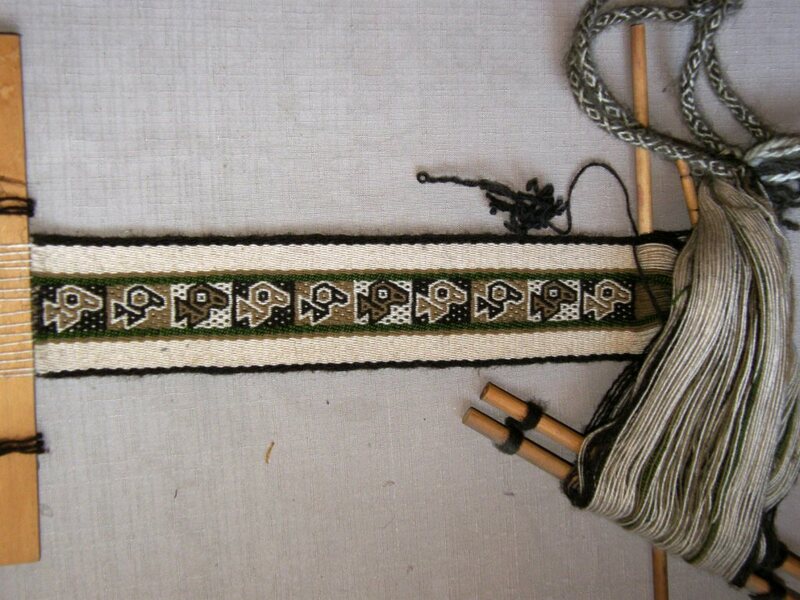 Thank you so much for the tutorial, I just might give it a go with one of my weavings. I love this multicolored technique. I can’t quite understand how it works – maybe instructions will be in your next book? And thank you for the links to the other blogs. Very interesting. How fun for you to return to Australia. I love your blog, I learned more from you than from any books. Yay, Australia, I’d do anything I can to be there! Thanks for the lovely post. 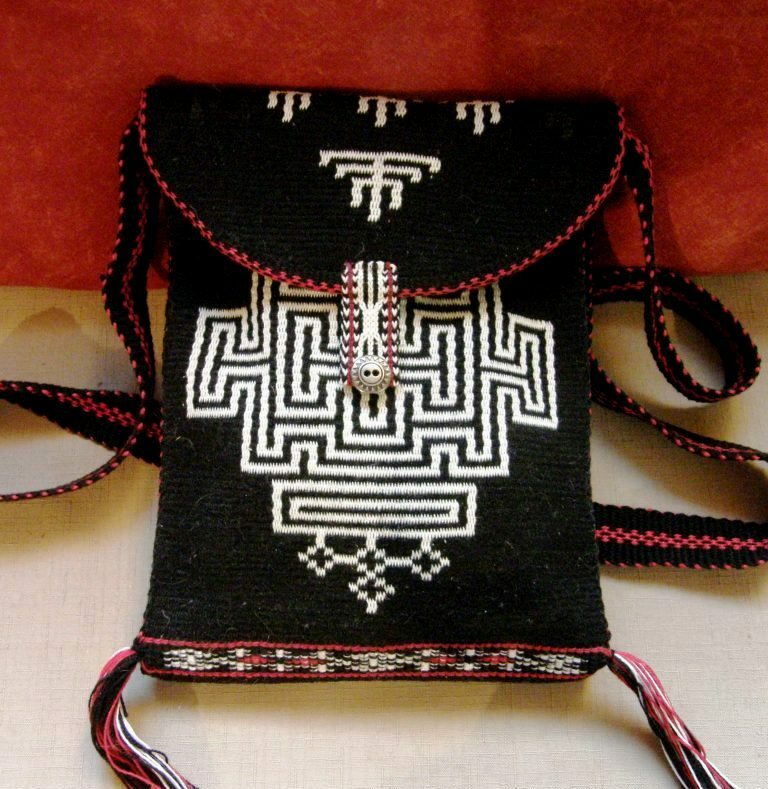 The bag with nepali coin is gorgeous! 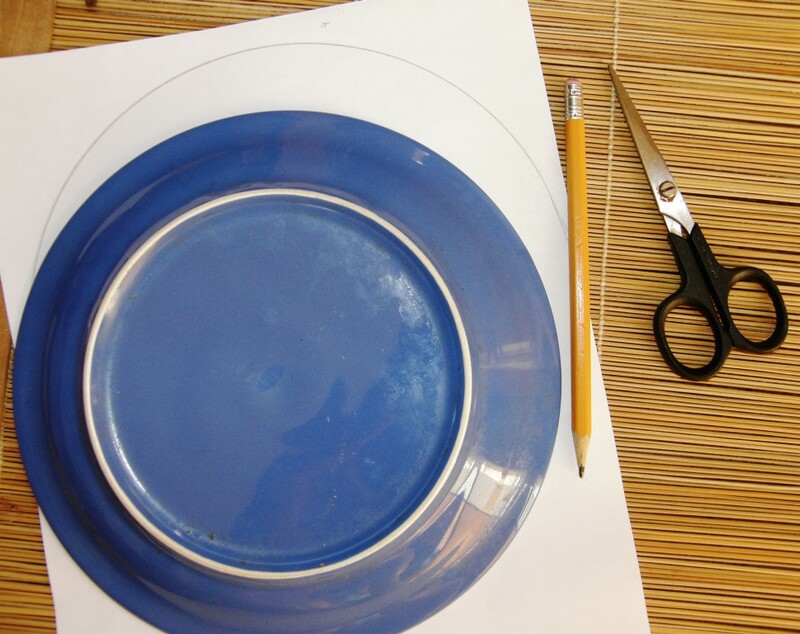 Great edging tutorial. Has many applications, not just for backstrap fabrics. I love your little phone pouches. Thanks for the tutorial. I can’t wait to try it out. Is the pattern on the orangish-red one with the flower & butterfly in one of your books? Hi Kristin. Thanks! I don’t have that particular pattern in my book. It requires a lot of threads! I kept the projects in my book which are based on that structure quite small. If you try the intermnesh technique that I teach in the second book, you will soon see how easy it is to “wing” those kinds of patterns. I started off charting the flower that is on the cell phone pouch and then ond that my chart was off. So, I tossed the chart and just wove on. 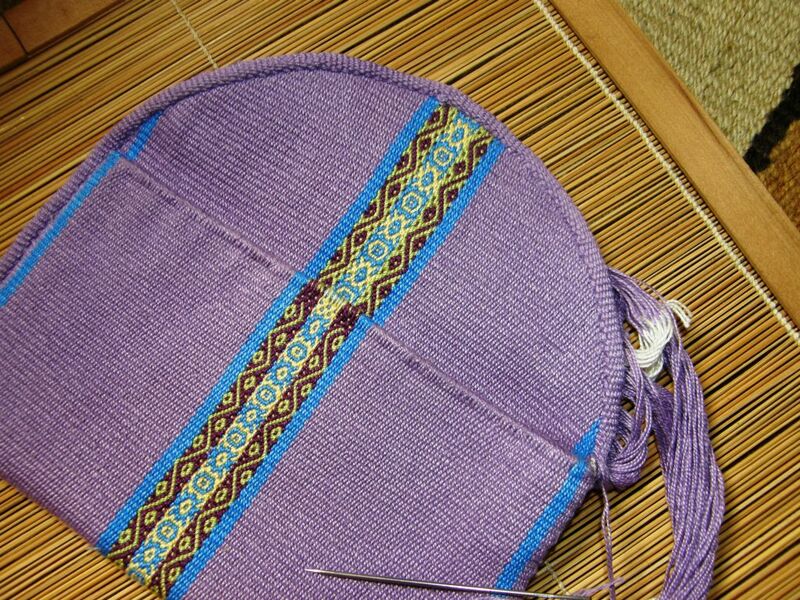 Then, I was able to weave the nettle just by looking at one on a piece of fabric and didn’t need to chart it at all. In fact, I think I made some improvements on the original :-). I think that’s a special talent to just ‘wing’ it, but with practice I’ll be able to at least chart something similar. Thanks. So much eye candy… You know how crazy I am about those thistles. Thanks for a great post on finishing. Hi Terri. Nice to hear from you. Your backstrap project is on my mind!